There is increasing interest in meditation with regards to the prevention and treatment of different health conditions. This article briefly outlines the science behind the meditation in the light of research evidence. We also discuss the different health benefits and possible risks with this practice. The aim of the meditation is to achieve a ‘thoughtless awareness’ mental state (‘mental silence’), where the mind is calm, peaceful and free of any automatic thoughts (‘mind wondering’) and internal dialogues (‘mental clutter’). This peaceful mental state and relaxation cannot be achieved through sleep or other deep relaxation techniques alone. Meditation, therefore, is different from sleep and other relaxation strategies. One of the main goals of meditation is to improve the concentration and attentional skills. Meditators observe the mind closely if the focus of concentration is wandering off. If this happens, the meditator would need to bring the attention back to the focus of concentration. This involves observing all the thoughts coming to the mind (both automatic thoughts and in response to external events) closely in a non-judgemental way. Therefore, they do not actively respond to any thought. It has been observed that practicing open monitoring slowly reduces the frequency of automatic thoughts/ mind wondering. Meditation has been shown to have both short-term (known as ‘states’) and long-term (known as ‘traits’) benefits. 5) A balanced and positive attitude towards life. Can meditation be used as a therapy? 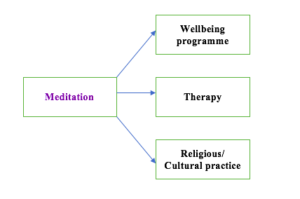 Meditation has been an integral part of many religious/ cultural practices, wellbeing programmes/ Mind-Body techniques, such as Yoga, Tai chi, and Qigong. There is also a growing interest in meditation in the Western medicine both as a treatment and a complementary method (along with the ongoing conventional treatment). 1) Mindfulness-Based Stress Reduction (MBSR): for chronic pain, cancer, and migraine. 2) Mindfulness-Based Cognitive Therapy (MBCT): prevention of a relapse of depression episode. for the treatment of substance misuse. 2. Coping with chronic physical health problems, including pain. 3. Complementary treatment for psychiatric conditions, such as anxiety and depression. 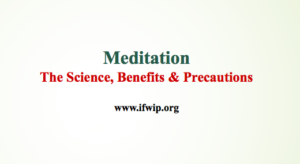 What is the scientific basis for the meditation practices? Numerous studies have been done to investigate the impact of meditation on the neurophysiology and other systems. Beneficial effects of meditation have been shown in many studies. However, the result varies among different types of meditations, as the practice varies quite significantly. Therefore, it is difficult to ascertain a ‘dose-effect’ relationship and draw definite conclusions. Moreover, there are many variables/ bias in the studies, including the personality, personal beliefs (on the benefits of meditation), prior experience of meditation, and the mindset of the individuals undertaking meditation practices. Therefore, the results should be interpreted with caution when it is extrapolated to the wider population. B) The effects on the immune system. What impact does the meditation have on the brain functions? – Specific EEG changes (mainly Theta waves) in many parts of the brain. The Theta activity indicates a state of relaxation at rest (but awake). – Activation of some specific areas of the brain and nerve networks (connections between different parts of the brain). – Increased secretion of certain neurohormones and neurotransmitters. Please find the detailed mechanism of stress response here. 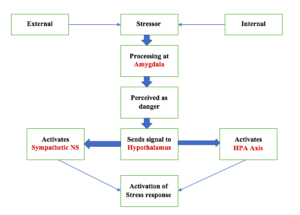 In summary, the amygdala assesses the stressors and if it feels that there is a threat/ danger, then sends a signal to the hypothalamus to initiate a stress response (with the activation of the sympathetic nervous system and the HPA axis). Activation of the anterior cingulate and insula areas help in the reduced sympathetic activity (as they decrease the activation of the amygdala). Therefore, meditation leads to a reduced activation of the Sympathetic nervous system/ HPA Axis. This, in turn, leads to an activation of the parasympathetic nervous system and maintaining homeostasis/ stability (both physical and mental). As a result, meditation leads to reduced ‘Fight and Flight’ response and stress relief. Reduced resilience to stress helps in the prevention of Blood Pressure related problems and heart diseases. 2. Frontal (prefrontal cortex and anterior cingulate cortex), mid and right central brain regions. The Theta activity indicates a state of relaxation at rest (but awake). This supports the concept of ‘thoughtless awakening’ during meditation. What is the Default Mode Network (DMN)? Researchers suggest that when we are not actively concentrating on something, our brain goes off into the Default Mode. During these times, our mind goes into an ‘autopilot mode’ and we experience ‘mind wandering’. Different thoughts come to our mind (both positive and negative) related to the past and future. Depending on the nature of the thoughts, we feel happy, sad or worried. The areas of the brain which are involved in this automatic thought process are collectively called the Default Mode Network (DMN). Therefore, the DMN is a group of separate (but closely connected) brain structures. Increased activity of fronto-parietal and fronto-limbic neuronal networks in the brain. This has been confirmed with Positron Emission Tomography (PET) scan. These areas are related to increased concentration and regulations of the emotions. Meditation leads to the release of hormones and neurotransmitters, such as Dopamine, Serotonin, and Melatonin, in the limbic system of the brain. They help in mood stabilisation, positive feelings, and a sense of wellbeing. Melatonin is also known to boost the immune system. Researchers have noted increased thickness of some brain structures (such as right middle and superior frontal cortex, and insula) with meditators. Increased grey matter density has been also noted in the right insula, hippocampus, and left inferior temporal lobe. The increased thickness of the right prefrontal cortex. This area plays an important role in the concentration/ attention span. Neuroplasticity is the unique capacity of the brain to change in structure and function throughout the entire life (especially in response to training, experience, and injury). Therefore, the gray matter can become dense and new nerve networks (synapses) can develop in certain areas of the brain, if they are regularly activated. On the contrary, if some brain areas remain less active, then they can shrink in size and the neural connections can fade away. With the advancing age, the thickness of the cerebral cortex (gray matter) decreases. Meditation has been shown to increase the gray matter thickness. The process of neuroplasticity is thought to be responsible for this change. Stress is now thought to activate an inflammatory process in the body. Therefore, chronic stress can induce a state of chronic inflammation, which can contribute to many physical and mental health problems. Research has shown that the meditation can reduce the inflammatory response. For example, chemical markers of the inflammation (such as Interleukin-6 (IL-6) and C-Reactive Protein), have been shown to decrease after the practice of meditation. This article on meditation would be incomplete without a brief discussion on mindfulness considering it’s growing popularity both in the healthcare sector and the corporate world. The aim of mindfulness meditation is to keep the attention focussed at the current moment. Then observing the thoughts coming to the mind without self-criticism. Mindfulness, like other forms of meditation, also encourages to accept the thoughts/ events of life as they are (in a non-judgemental way). Subsequently, Mindfulness-Based Cognitive Therapy (MBCT) was developed. The aim of MBCT was to prevent recurrence of depression. In 1998, Nancy Bardacke formally introduced Mindfulness-Based Childbirth and Parenting (MBCP) to be used during the antenatal period. MBCP is a class-based session (spread over usually 9 weeks) based on Mindfulness-Based Stress Reduction (MBSR) principles. This encourages pregnant women (and partners) to apply mindfulness techniques to deal with fear, pain, physical and psychological stress (which may be associated with pregnancy, childbirth, postnatal period and challenges of parenting). 1. Improvement of psychological wellbeing with a reduction in stress, anxiety, (antenatal and postnatal) depression. 3. Better parenting skills and emotional availability. There is a scarcity of studies looking at the adverse effects of meditation practices. Therefore, people with physical/ mental health illnesses should get the necessary advice (from medical practitioners and meditation teachers) before starting any form of meditation. 1. The aim of meditative practices is to achieve a state of ‘thoughtless awareness’. This refers to a peaceful mind without any disturbing thoughts. 2. Meditation is a wakeful state and different from sleep. 3. Different forms of meditation practices exist. However, one basic common theme is concentration/ attentional focus. 4. Meditation is being used as a form of treatment in different health condition and stress management strategy. 5. 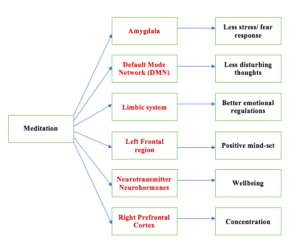 Research indicates that meditation leads to certain changes in the function and structure (neuroplasticity) of the brain, both in short term and long term. 6. The practice of meditation/ mindfulness could be beneficial during pregnancy and the perinatal period. 7. People with physical/ mental health illnesses should get adequate advice from a healthcare practitioner and an experienced meditation teacher before commencing meditation practices. There are some scientific data and case studies to indicate possible potential risks with meditation practices. 1) Househam, Ayman & Peterson, Christine & Chopra, Deepak. (2017). The Effects of Stress and Meditation on the Immune System, Human Microbiota, and Epigenetics. Advances in mind-body medicine. 31. 10-25. 2) Kabat-Zinn, J., 1982. An outpatient program in behavioral medicine for chronic pain patients based on the practice of mindfulness meditation: theoretical considerations and preliminary results. Gen. Hosp. Psychiatry 4 (1), 33–47, http://dx.doi.org/10.1016/0163-8343(82)90026-3. 3. Walsh R, Roche L. Precipitation of acute psychotic episodes by intensive meditation in individuals with a history of schizophrenia. Am J Psychiatry. 1979 Aug; 136(8):1085-6.